W e Americans may lag in our collective enthusiasm over pro soccer, but we’re certainly trying these days, with an increasing interest in our own league and, more locally, a shiny new stadium just unveiled downtown. 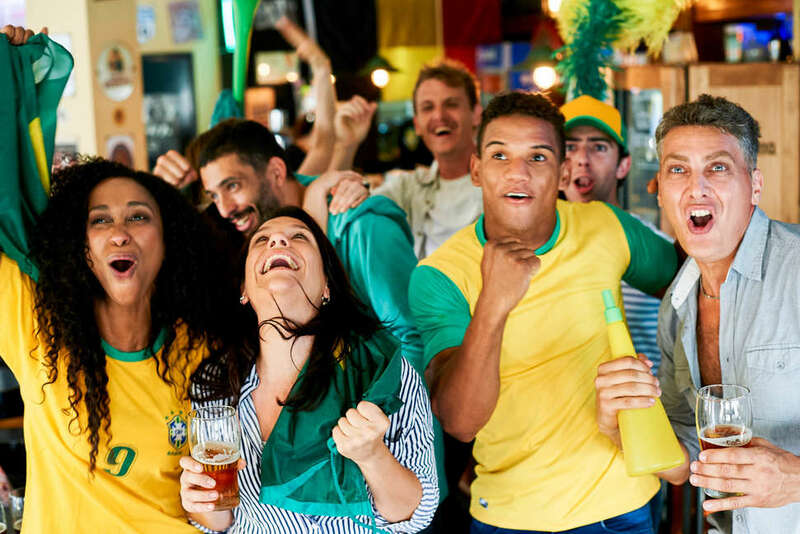 The World Cup kicked off on June 14 this year, hosted by our old pal Russia, and plenty of bars, pubs, and restaurants around LA will be airing games throughout the tournament (some will even be opening at 5am for die-hards who can’t miss a kick). Bummer the US team didn't make the World Cup this time around, but you can still join in the revelry, cheering on whatever country you like, or just drinking and people-watching (or all of the above). We’ve been doing some recon to scope out the best bars in LA to watch the World Cup this summer, and even checked in with former US men’s national team members Alexi Lalas and Stu Holden, who are a part of the FOX World Cup broadcast team, for some tips on their favorite soccer spots in Los Angeles. And be sure check back for updates on opening times and food and drink specials! 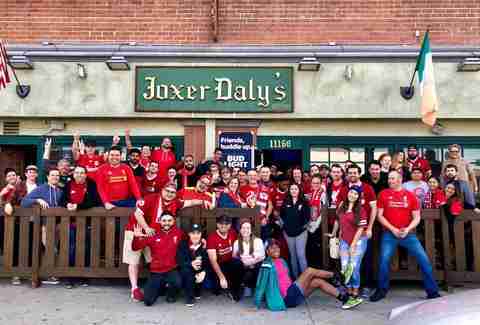 Joxer Daly’s is that quintessential neighborhood watering hole with its laid-back semi-divey vibe, decent pricing, and killer imported beer selection along with a patio of outdoor tables overlooking a nothing stretch of Washington Boulevard. 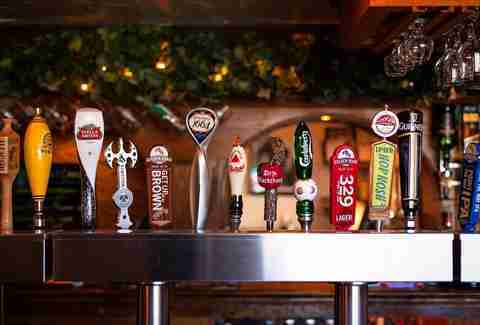 The bar, which draws a mixed crowd of die-hard regulars, after-work imbibers, day drinkers, and yes, soccer fans, is also guaranteeing it will show every single game, opening at 5am for your viewing pleasure. Specials: None, but the owners insist that their "prices are already below market" -- so, there's that! This stalwart British pub a quid’s throw from the beach is a labyrinth of wood-heavy dining rooms with royal portrait-lined walls, a beer-heavy bar, dart boards, TVs galore, and a bakery and gift shop touting British specialties. In other words, it's like a giant British museum. There'll be all the shepherd’s pie, bangers and mash, and fish and chips you'd expect, but YOKH will be showing the World Cup games starting at 8am, so you’ll want to take advantage of the traditional British breakfast plates complete with English baked beans. This duo of sports bars will be open for all the games (even the 6am starts) and offering a bacon-egg-cheddar-and-avocado-stuffed World Cup Breakfast Burrito with a side of tater tots for $12 -- because you’re going to need some sustenance to properly cheer on your team at that hour. If you plan to stay for the back-to-back games, you’ll want to move on to the fabled wings next. Wangs’ sibling venues -- The Thirsty Merchant in Valley Village and Elbow Room in Hollywood -- will follow suit, opening early in time for all the games and serving up the same brekkie special. LA’s oldest bowling alley (which actually dates back to prohibition) is looking good thanks to its refurbished retro look, a trio of bars, and a big, beautiful 1930s mural, as well as solid pizza and cocktail offerings. For the quarterfinals, semifinals, third-place playoffs, and the final game, HPB will open early to screen the games on the 15-foot projector over the bowling lanes, with sound -- so you can watch one sport while playing another. Specials: Happy hour and food specials for the final-round games, and prize raffles during the final game. The museum and cultural center will be the site of three big (and free) viewing parties with live entertainment, activities for the kids, a photo booth, and -- since it’s sponsored by McDonald's -- a free breakfast courtesy of the fast-food behemoth. Doors open at 7am on Sunday, June 17 (for the Mexico vs. Germany and Brazil vs Switzerland matches); Saturday, June 23 (Mexico vs. Korea and Germany vs. Sweden) and Sunday, July 15 (finals). If you plan to go, register here. This 60-plus-year-old Packers bar on Aviation Boulevard draws a raucous crowd of jersey-wearing fans come American football season and gets an equally enthusiastic influx of screaming soccer-loving patrons during World Cup days. The plan is to start showing all the games on Hangar's 17 TVs starting at the usual 7am opening time, but the place may decide, as it gets closer, to open the doors at 5am for some games; call ahead to find out which ones. If you’ve got a soccer-loving pup you don’t want to leave at home, this German eatery is your go-to thanks to its dog-friendly, flat-screen-adorned outdoor beer garden; expect a 120-inch projection screen in the “soccer room,” in addition to more TVs in main part of the venue. The place will be offering food and drinks specials during all of the matches it airs, in addition to special morning breakfast and brunch menus, sponsored giveaways, and post-game deals. Wirsthaus will be opening early for all of the Germany and Mexico matches, including those on June 17th (at 8am), 23rd (at 8am), and 27th (at 7am). Specials: A World Cup food menu including potato pancakes, pretzels, sausages, and schnitzel; half-off Erdinger beers for those who stick around after the game. Artisanal Brewers Collective’s stylish new British pub boasts both an onsite brewery (which will start brewing its own beer in the coming months) and an adept kitchen, churning out Cornish classics like Yorkshire pudding and fish and chips, as well as vegan-friendly options like a plant-based Welsh rarebit and Impossible burger. World Cup games will be screened on TVs in the bar and on the patio and via projector in the dining room, opening at 7am on weekends and 11 during the week. 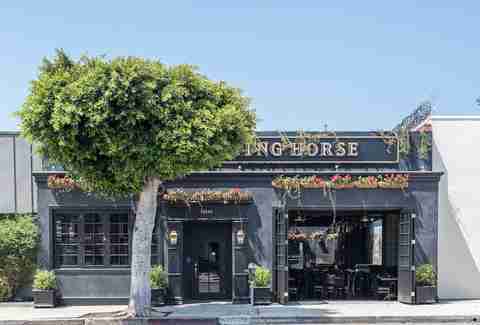 Pro tip: You can book seats in advance on The Stalking Horse's website. Specials: $4 drafts during games and multiple $4, $6, and $8 “breakfast of champions” offerings available at 7am on weekends. This colorful Brazilian cafe with a lush patio doesn't have a proper bar (though beer and wine is available) and offers just two TVs, but it’s a top spot for those cheering on the South American soccer team who want to be amongst fellow fans and take advantage of a good and cheap breakfast menu with specialties like fried plantains and acai bowls. Later in the day, look for fish specials, pastas, black beans and rice and empanadas. Stay tuned for early opening hours, as the place will most likely get going in time for early AM Brazil games and lots of impressively long goooooooooaaaaaaaaal-yelling. 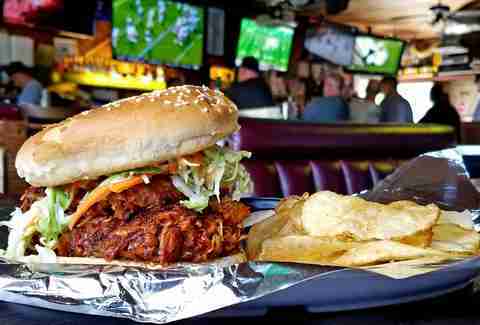 This South Bay sports bar is reminiscent of a TV network control room thanks to its rows and rows of flat-screens -- 50 in fact, all of which make for some great game viewing. There’s an attached street-facing patio if you want to get some fresh air or some natural light after gazing at screens in a dark bar all morning, and there’s also a basic breakfast menu in addition to the usual bar fare. Sharks Cove will open at 5:30am for the Brazilian games and 7am for every other game, and the kitchen will start serving food at 8am. 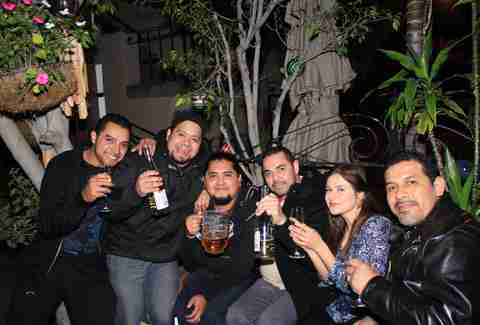 Specials: Buckets of Bud Light or Coors Light for $16.75; buckets of Corona for $19.25; $5 Jager shots or Jager bombs; $4 Fireball shots; 22-ounce domestic drafts for $5.50; 22-ounce Modelo, Corona, or Pacifico for $6; $5.50 Estrella Micheladas; 22-ounce double shot Bloody Marys for $9.50; and free bottomless champagne or Mimosas with purchase of breakfast on weekends. 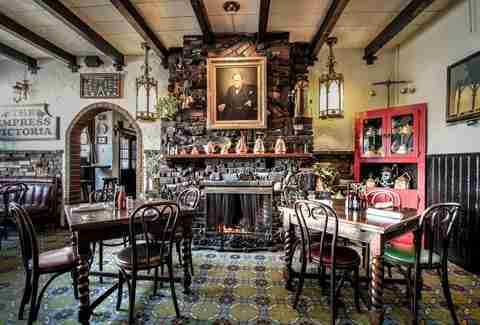 This Ventura Boulevard pub is known for doling out plenty of British breakfasts and beer to fans who come in to watch international sports, so we’re expecting the World Cup scene to be pretty tremendous. You'll be able to watch all the live tournament games on its two projector screens, as well as the 10 TVs scattered throughout the bar. The venue will be opening early to show every World Cup match, but certain games will require tickets. Check the schedule here. The resurrected Hollywood pub may not have that same signature sprawling patio at its new location, but you’re here to watch soccer anyway (and there is, indeed, some outdoor space at this venue). Expect British fare to the tune of Scotch eggs, shepherd’s pie, and curried chicken, along with lots of draft beer offerings and fun cocktails like the Picadilly Pimm’s. The venue will be opening early for several of the matches; check their schedule here. The Kimpton Hotel Palomar’s onsite restaurant, bar and lounge -- inspired by the look of a Hollywood backlot -- comes complete with a clubby game room filled with Skee-Ball, pool, shuffleboard, darts, video games, and some newfangled 4K Ultra HD TVs ready to show you tons of World Cup action. The venue will be airing all World Cup games beginning at 6:30am daily. Find out where to watch the World Cup games with all the soccer fans in your city with our list of the best World Cup bars in NYC, SF, Chicago, DC, Miami, Houston and more. Lizbeth Scordo is a food and lifestyle writer. Follow her on Instagram @modlizbeth and Twitter @lalizbeth.